So many, many crosses. And all from one Cross. Then … what was it exactly? What was there about that first Cross? On the third week of Lent, the Orthodox celebrate a feast called “The Exaltation of the Cross” or “The Veneration of the Cross” or it can go by other, longer names. It is an opportunity to reflect on the journey we’re on to Golgotha and Christ’s sacrificial death. But what would a grade school child think? I wasn’t in an Orthodox church when I was 10 — I probably had never even heard of the Orthodox Church back then — so I had to guess. What would children make out of this feast? And what would they think about the bigger issue of Christ’s suffering death for us? Abigail knew, or she thought she did. She knew about Jesus Christ and that He died and then rose from the dead. She had been told the story, it seemed, almost as many times as there were crosses in church. But she hadn’t really thought about it having a lot to do with her. It all seemed so far away somehow. There were some parts of the story she didn’t understand. There were other parts that she did understand, but they seemed … big. Overwhelming. They were too big for your head, like the way she felt when she had seen an enormous blue whale on an oversized movie screen once. It was just hard to take it all in — scary and really wonderful at the same time. The Smithsonian’s whale scared the pants off me every time. But I loved it! I’m invoking something from my childhood here. 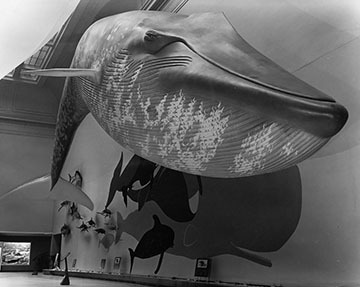 When I was young, we lived near Washington D.C., and would take occasional field trips to the Smithsonian Natural History Museum. In those days, when you first walked in, you saw an African elephant (stuffed, of course) in mid-stride, with trunk raised and ears flapping. It was so gigantic and majestic that I could hardly believe it. But then, I would hold my breath and look over to my left. Because I knew that the room on that side had a life-size facsimile of a blue whale that looked like it was swimming right at you. And it completely blew my mind, every single time. How could anything be that enormous? I think of that kind of staggering, visceral awe when I read passages in the Bible about the fear of God. Because I have heard from some knowledgeable Orthodox people that the fear being talked about doesn’t have as much to do with fright, dread and horror as it does with amazement, shock and wonder. Like my blue whale at the Smithsonian, and Abigail’s on a giant IMAX screen, it just shorts out all your senses and boggles your mind. And that, I think, is something even a child can understand about the truth that is revealed in the Gospels — the truth of a powerful, righteous and saving God that we learn about over the course of our entire life. Whether we grew up Christian or not, chances are we were hearing the story of Jesus Christ’s life and death from the time we were young. We probably heard Christian claims that this man, who declared Himself to be the Son of God, died for us and rose from the dead. But do we really try to take that in? Do we let ourselves be amazed, as a child would be amazed? Abigail’s eyes strayed up to the dome and the great image of Christ Himself looking down on them all. That image larger than any other, seeming to fill up the sky. One hand was raised in blessing. The other was on a book and on the book, a cross. She seemed to hear that voice again. Do you see, Abigail? Do you see? I wrote that passage for me, to give me a little kick. Do I really look, when I’m in church? Do I really listen? Lent is halfway over, so it’s worth thinking about, because we’ll arrive at the days of Holy Week sooner than we know. The cross of Christ is there every week in church, and extra attention is paid at the feasts of the Cross. But do we see? Hello! Do you know the story of St. Abigail as the Orthodox Church knows it? I have been trying to look for it but cannot find it. I usually go off to http://www.oca.org — they have an incredible inventory of the saints and hagiographies — but they didn’t seem to have anything for her. I did come up with this interesting post from a priest’s blog — HERE . He had some very interesting thoughts on how we can apply the lessons from Abigail’s story.